Do “human rights”—as embodied in constitutions, national laws, and international agreements—foster improvements in the lives of the poor or otherwise marginalized populations? When, where, how, and under what conditions? 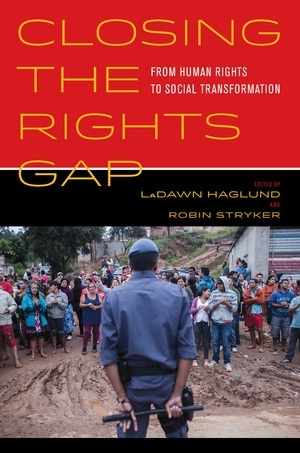 Closing the Rights Gap: From Human Rights to Social Transformation systematically compares a range of case studies from around the world in order to clarify the conditions under which—and institutions through which—economic, social, and cultural rights are progressively realized in practice. It concludes with testable hypotheses regarding how significant transformative change might occur, as well as an agenda for future research to facilitate rights realization worldwide. LaDawn Haglund is Associate Professor of Justice and Social Inquiry at Arizona State University and author of Limiting Resources: Market-Led Reform and the Transformation of Public Goods. Robin Stryker is Professor of Sociology, Affiliated Professor of Law, Affiliated Professor of Government and Public Policy, and Research Director, National Institute for Civil Discourse, at the University of Arizona. She publishes regularly in journals including American Journal of Sociology, American Sociological Review, Law & Social Inquiry, Sociological Methods and Research, Socio-Economic Review, Research in the Sociology of Organizations, and Social Politics.